To all the passengers who responded to our pre-retirement posts by ‘You can’t take the boat away!’ we’re happy to say that we’re expecting Shearwater to continue to work around Ramsey this season (mid May to early September, with limited Autumn sailings), either as part of our retirement blast or with a new set of hands at the helm. We’re running this season (2018) to give time to continue discussing things with potential new owners. This gives us the flexibility to hand over to another owner as early or as late in the season as they wish (or indeed over next winter in time for the following year) while enjoying the boat work ourselves in the meantime. Yes we’re partly in denial 🙂 and still enjoying getting covered with salt water but we are also ready to hand over the helm to suitable hands as soon as they’re ready. Buying a boat business like ours is also buying a lifestyle. We love being our own boss and this business does give us an unusual amount of freedom and flexibility, with the huge bonus of a much loved jet boat to go and blast away the paperwork cobwebs! The key question for anyone considering taking the business on is ‘Would it work for you, with your skills and interests and the lifestyle you want to achieve?’. Jet boats require specialist handling and our trips are designed around Shearwater’s unique handling abilities. 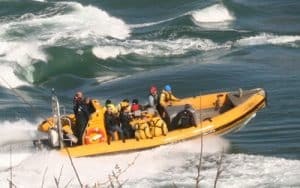 Jet boats are not for the faint-hearted 🙂 but after decades of exploring Ramsey and the St Davids coastline as only jet boats can we can say that for the right people it’s a great way to make a life. Thank you to our passengers for enabling us to spend so much time playing around on jet boats. We look forward to continuing to do that in May so we’ll see you on the water soon 🙂 . We have more information here but if you’d like to discuss whether or not this business could work for you then feel free to call us on 01348 837764 or email us at info@venturejet.co.uk. If you know someone looking for a marine business adventure please pass this on 🙂 .